2009 marked the centenary year of MI6, the British Secret Service, and to commemorate the occasion, they invited artist James Hart Dyke behind the scenes of the legendary organisation in order to observe what truly goes on in the world of espionage. Dyke is no stranger to top class missions and facing dangerous situations for his art. Previous projects that he has worked on have included painting in war zones with the British Forces and accompanying HRH The Prince of Wales on foreign royal tours. His latest mission with MI6 is now the subject of an exhibition at Mount Street Galleries in London, although everyone involved is quick to point out that none of the drawings or paintings that are on show reveal any sensitive information about the Secret Service or its agents. For the first time, we can now get a glimpse at an outsiders unique rendition of the existence of those who work for MI6. 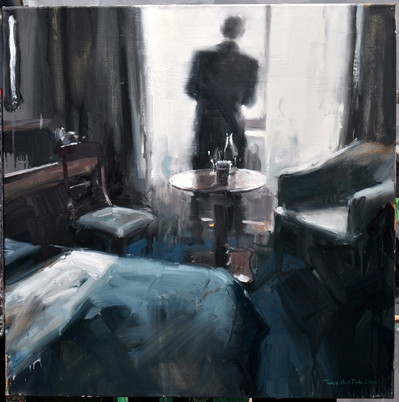 The paintings and drawings are said to have a great amount of mystique and ambiguity that reflects upon the manner in which the the work of the MI6 agents is often surreal and even glamourous to us as viewers. Dyke is said to have found the project very challenging, given that there were a great many restrictions and limitations to what he could be exposed to while at Vauxhall Cross, the Secret Service headquarters. Each and every observation that he made has been highly scrutinised and screened before being allowed to go on public view, and he was limited in the amount of time that he could spend painting on location. The outcome of the project is certainly fascinating, and strikes up a great amount of curiosity. Here is our chance to move beyond the myth of James Bond and find out what it's really like to be a secret agent. For more information about James Hart Dyke, visit his personal website, and for details of the exhibition, visit the Mount Street Galleries website. The Art Institute of Chicago has something to celebrate, as they announce the acquisition of one of the most significant pieces of art to join their incredible collection. Kazimir Malevich's iconic painting, entitled Painterly Realism of a Football Player - Colour Masses in the 4th Dimension, of 1915 will join the collection in Chicago as the first acquisition of 2011, thanks to the Art Institute's Acquisition Fund. By appearing in Chicago, the painting, which is of great significance and importance in the art historical canon, will sit amongst many other great works of art, including Georges Seurat's A Sunday on La Grande Jatte, 1884; Edward Hopper's Nighthawks, 1942; Grant Wood's American Gothic, 1930 and Henri Matisse's Bathers by A River. While the museum has a notoriously strong collection, they are still a few gaps that have yet to be filled. Bringing in Malevich's work helps them to fill one of those gaps, with the work being the first of Russian Suprematism to grace the galleries of the Art Institute. Interestingly, with this acquisition, the museum becomes only the second public institution in the whole of the United States to feature a Suprematist painting by Malevich in their collection. 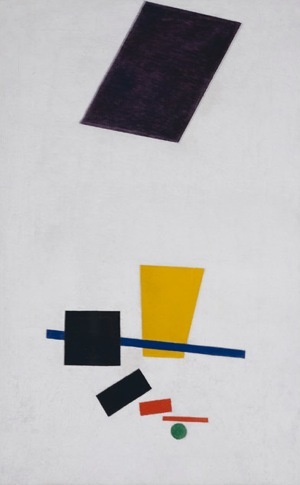 Russian Suprematism was an art movement which formed in 1915, and was fully focused on the representational value of the fundamental geometric shapes. Malevich was the founding member of Suprematism, having already worked his way through the artistic modes of futurism and cubism. As a form of abstraction, Suprematism was radically reductive - portraying recognisable and everyday subjects in a non-objective manner. Malevich reached complete abstraction, and the purest form of painting with Black Square of 1913; the ultimate reduction of painting and the most basic element of artistic creation. 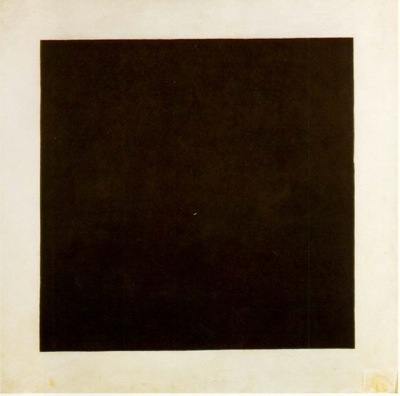 In Suprematism, once the state of the Black Square was reached, the artist was free to step through to a new form of art; a return to the start of creation. Painterly Realism of a Football Player takes the Suprematist values of geometric reduction, and the analysis of the relationship of shapes and form in the modern world, and represents them in a purely abstract manner. The work itself avoids all political, social and natural relationships with the world and tunes into the more primitive values of a world broken up into squares, circles, rectangles and triangles. The work came to the museum through renowned art dealer Larry Gagosian, who acted on behalf of the Malevich's heirs who had put the work on offer. It is great that this work will go on show to an international audience as it takes its place in the Art Institute of Chicago, to sit as a deserved superstar of the art world, amongst its international contemporaries. Probably best associated with the Hudson River School of New York, Asher B. Durand was one of America's foremost landscape painters. An exhibition of his work is now being shown at Fundación Juan March’s headquarters in Madrid. Like many artists of his generation, Durand made a tour of Europe in June 1840, and this is the biggest return of Durand's work to Europe since then. As the first monographic exhibition devoted to his work outside of the U.S.A, the exhibition includes 140 works which pay homage to Durands talents as a landscape painter, but also as a portraitist. For anyone interested in landscape painting, this is an exhibition not to be missed. While not entirely devoted to his work as a landscape painter, there will certainly be some first class examples of large-scale nineteenth American landscapes on show. Durand spent a great amount of time between New York and the surrounding countryside along the Hudson River. 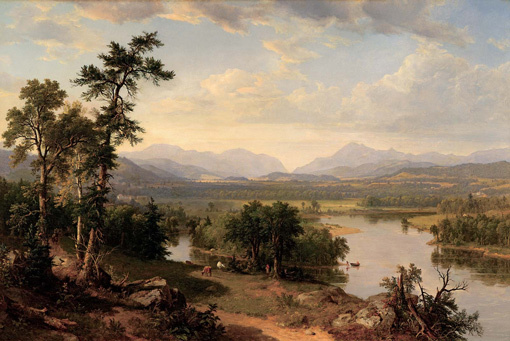 Painting in the Catskill Mountains, Adriondacks and the valleys along the river, Durand created some of the most iconic images of nineteenth century America and servers as an example of the celebration of the great outdoors. For European visitors to the exhibition who may be unfamiliar with the work of Durand or the Hudson River School, there will no doubt be a great number of parallels that can be drawn between some of the well know European masters such as Turner, Constable, Rubens or Claude Lorrain. Friday 24th September 2010Has Monet Messed with Your Mind? Earlier this week a much talked about and anticipated retrospective of Claude Monet's work opened at the Grand Palais in Paris. The exhibition brings together works from every phase of his career as an artist, and has masterpieces-a-plenty, making it an unmissable show, especially if you haven't had the pleasure of allowing Monet to play tricks on your brain and mess with your emotions. Yes, this week Gallereo has taken to a path of scientific enlightenment by reading New Scientist. 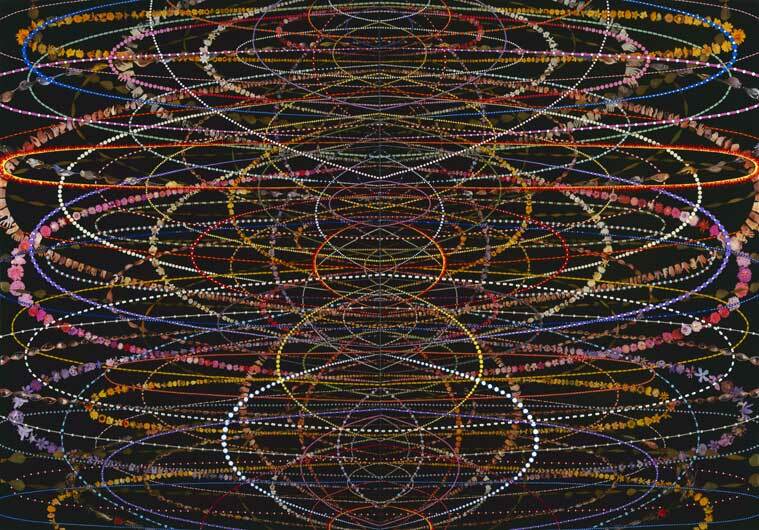 Beyond quantum physics and discussions of time and space however, there was an interesting article on the arts and the way that artists have been messing with our brains for centuries. Our understanding of the way the brain works is still relatively limited, and it is only recently that we have started to understand they way that the brain deconstructs images. In the scientific field of neuroaesthetics, scientists have been looking at the way certain images and methods of painting or drawing help artists to plug into our subconscious mind, trigger neural conflicts and trick our minds into believing the impossible. In light of the blockbuster Monet exhibition, and the flocks of Impressionist fans who will make the trip to pay homage, the branch of the article, by Jessica Griggs, that asked "Why is Impressionist painting so popular?" struck a bit of a chord with us. The answer? Firstly, it would seem that we are drawn to Monets rough, and broken painterly style because it forces the brain to conjure up a more personal interpretation the work. If the work had been painted more like a photographic representation of the scene, the brain wouldn't have to fill in the gaps. By causing us to fill in the gaps, our experience becomes more visceral, with our brain applying memories and deep emotions to the work. 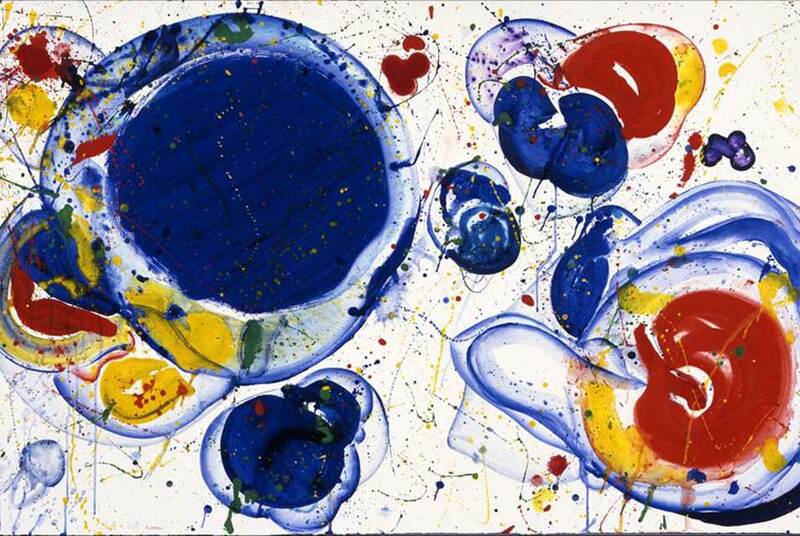 It is also thought that this particular style of painting speaks directly to the amygdala; the part of the brain that processes emotions. This part of the brain acts like "an early warning system, on the lookout for unfocused threats lurking in our peripheral vision, and tends to react more strongly to things we haven't yet picked up consciously." Research has shown that the amygdala reacts far more enthusiastically to things that it can't quite make out, giving the Impressionist style of painting a privileged level of access in the brain. So there you have it, Impressionist works are so popular because our brains are a little bit wary of what they can't quite understand, and therefore we pay a lot more attention them, even if it is on a subconscious level. You can read the full article by Jessica Griggs, and find out more about the neuroscientist in charge of the findings, Patrick Cavanagh, in the article "Six Ways that Artists Hack Your Brain". This marks the continuation of a great string of exhibitions at the BALTIC over the past few years that have brought some really amazing names, and some fantastic artworks to the region. At the moment there is an exhibition of John Cage's prints, drawings and watercolours; perhaps lesser known mediums for the American composer, writer and artist but nonetheless something different and well worth the visit. In recent years we have seen the likes of Sarah Sze, Damien Hirst, Jenny Holzer, Martin Parr, Yoko Ono, Yoshitomo Nara, Bharti Kher and Steve McQueen at BALTIC to name just a few. This latest announcement will see one of the greatest European post-war painters going on display. The exhibition that is to be displayed over 2 floors of the BALTIC gallery space with cover a diverse range of work spanning four decades and including everything from paintings through to his monumental installations. Kiefer created a large body of work dealing with myth, history, theology, philosophy and literature, with much of his work being used a vehicles for him to come to terms with the history his home country, Germany. We look forward to visiting BALTIC to see Kiefers work, hopefully you can visit too!